The mission of the Grand Rapids Community College Radiologic Technology program is to demonstrate radiographic skills, critical thinking skills, communication skills, apply radiation safety, patient care, professional attitudes, and lifelong learning characteristics that will prepare students for entry into the workforce of diagnostic medical imaging as a registry-eligible radiographer. Graduates of this program, upon successfully completing the registry examination of the American Registry of Radiologic Technologists (ARRT), are prepared for entry level positions in hospitals, clinicals, private offices and traveling technologist employment. The Radiologic Technology program at GRCC is accredited by the Joint Review Committee on Education in Radiologic Technology. The employment outlook continues to be favorable for Radiologic Technologists. Clinical practicums associated with GRCC’s program have been established within a 50-mile radius of Grand Rapids Community College (sites subject to change). 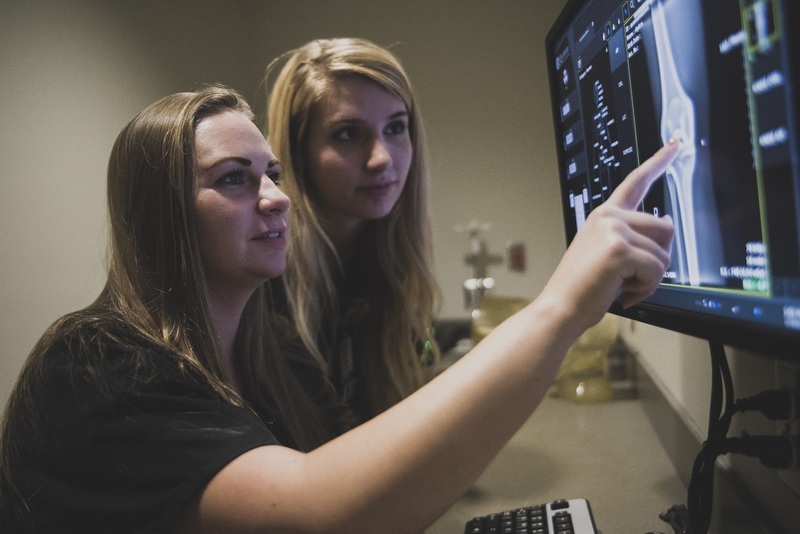 These practical experiences seek to heighten students’ awareness of patient communication practices and to acquaint them with all phases of radiologic technology practice, which often varies from hospital to hospital. The personal contacts developed during clinical experiences often help students in securing jobs after graduation. The Radiologic Technology program is a two-year program and requires attendance for six semesters including two summer sessions. In order to be eligible for admission into the Radiologic Technology program, students must: Be a high school graduate or have passed the high school equivalency GED (General Educational Development) Test. Have a high school GPA of at least 2.0. Have completed in high school a one-year course in algebra with at least a grade of “C” or better. (Suitable equivalent courses are available at GRCC for college credit.) Score at least 40 on the algebra and 76 on the Health algebra test. Score at least 74 on the Health reading test. Complete and pass a 7-panel drug screen. Complete criminal background check process. Students will not be allowed to enter the program until cleared by GRCC police. For additional information, refer to the Health Programs general information page. In addition to tuition, fees and books, there are additional costs. Estimates of these costs may be obtained from the Radiologic Technology office. Complete and earn a grade of “C” or higher in BI 121 and BI 122 within two attempts. In order to be eligible for graduation, Radiologic Technology students must earn a minimum of “C-” in each Radiologic Technology course. Effective Winter 2015, RT 211 will become a 2 credit/3 contact hour course. Effective Winter 2015, RT 215 will become a 4 contact hour course. RT 100 will be assigned by Department immediately before starting the program. These Arts and Sciences courses may be taken prior to admission to the Radiologic Technology program. Clinical observation is required during the summer preceding entry into the Radiologic Technology program. BI 121 and BI 122 must be completed with a “C” or Higher. Students will be required to perform certain physical functions in order to successfully complete the program. You will perform them throughout your course work and/or clinical experience and later in your employment. These functions are not conditions for admission to the program; they are listed for the purpose of alerting you to what physical functions will be expected of you. You will assist in transferring patients from the wheelchairs and beds to x-ray table and vice versa. These patients may be comatose, paralyzed or suffer from some degree of incapacity. You may have to move heavy equipment such as portable x-ray machine to different locations. In the course of performing your duties in radiography you will be expected to stand and reach overhead to position the x-ray tube hanging from the ceiling; you must move quickly in an emergency; you must perform your work standing over a long period of time. You must have the ability to hear sound from a distance of 15 feet–approximately the distance between the control panel and exposure switches and the x-ray table where the patient is being placed. You must also be able to hear faint sound signals emitted by a dysfunctional machine. You must have vision to enable you to differentiate changing colors of the x-ray films, to read marking on dials, digital monitors etc. Good motor skills, eye-hand coordination skills, and at least sensory function in at least one upper limb are needed to align body parts of a patient with the film. Many other functions also require dexterity, including filling syringes, putting on surgical gloves, and manipulating locks on equipment. Motor skills such as standing, walking, and writing are all required to perform your duties. In addition, you must have fine motor skills, such as, the ability to make insertion of IV lines, calibrate equipment, draw blood, and so on. You must be able to communicate in English orally and in writing. Example: You must be able to read and give directions and instructions and to record health data from patients.